This emblem and the organization for which it stands has provoked the curiosity of many. Before you become entangled within it, read carefully the FACTS contained in this book. You will find it to be an astonishing and eye-opening revelation. We feel it is breathtaking in interest, intriguing, and shocking — but it is all the TRUTH, carefully documented. We feel it is high time these little known facts be published for Our Church members. We need to know HOW it came about that, even in our modern times, as the Word of God foretold: "all nations were deceived!" It is important that members of the Church know something about the Masonic Lodge — its teachings and its beliefs — so that they can answer questions on the subject with understanding. Many persons who are interested in the WAY OF LIFE ask questions that need a true and accurate answer, not the evasion they get when they ask information from a Mason. "The grand object of Masonry is to promote the happiness of the human race. " — George Washington. Masonic doctrine is very pliable because it is so loosely knit together and embodies such a tremendous scope of Christian as well as pagan ideas. Furthermore, it is cushioned with allowances for those members who wish to disagree with either or both because the Lodge embraces men of all religions. These allowances also absorb or explain away any accusations brought against Masonic doctrine. It makes no difference whether the accusation is pro-Christian, pro-Mohammedan, pro-Pagan, or pro-anything. To be more specific, Masonic philosophy is very inexact, vague in principle and so devious in application that it can mean almost anything to anyone. Its basic teaching method is by subtle suggestion which allows the candidate to warp his former beliefs into the Masonic framework. They set as the highest and simplest of these morals "brotherly love" — (the brother referred to, however, is a brother Mason). The spirit of Masonry is that of mystery, feigned pomp and ceremony, and intemperate revelry. They search ancient writings, Christian and pagan, in order to find the mysterious secrets of life. Membership in the Lodge is, therefore, a ticket to favoritism in any city or any state or any country, and is a Masonic promise to happiness and prosperity. One does not ordinarily realize the scope or importance of Freemasonry in our country. Its different rites, all in an interdependent system, boasted 4,175,000 members in 1939 — 3,300,000 of which were in the United States. There are probably between five and six million members in the United States today. One seldom sees anti-Masonic literature, even though much has been written. Because printers are often Masons, dedicated to conceal the secrets of the Lodge, it has little chance. Bookstore owners or librarians seldom stock books either pro — or anti-Masonic. Laymen who are Masons are unwilling to divulge secrets because they have been sworn to secrecy. The great majority embrace Free — masonry for the purpose of enhancing their business prestige. As long as they can pass themselves as Masons and make use of the secret language which Masonry puts within their reach, they are perfectly satisfied and desire nothing more. As the candidate proceeds thru the degrees, no one points to any of the facets of Masonry and says, "That is condemned by God Almighty." On the contrary, each aspect is drawn up in beautifully phrased allegories — the high (human) morality being greatly emphasized. Who would dare question this "holiness"? Masons' wives or children may not attend the regular meetings, but only such special functions as may be planned for them. To satisfy the desires of wives and children to take part in Masonic functions, special or side orders were adopted — such as the Eastern Star ritual, the De Molay for boys, and the Rainbow Girls. These orders have their own secrets and functions apart from the regular Lodge, but follow its general pattern. They are supervised by Masons. Indeed, their meetings cannot be held without a Mason present to supervise. Because Masons are forbidden to solicit new members, a man must request admission for himself. Before attending any meetings or taking any part in Masonic rituals, the candidate must be initiated. On his first visit to the Lodge, he is kept outside in the anteroom (see Figure 2) while the first part of the meeting takes place. Neither he nor anyone else has a chance to know what is going on in the meeting because the door is closed and a guard — usually with drawn sword — is standing beside it. Finally, three raps are heard at the door and the guard (whom he will later come to know as the "TYLER") returns them in like manner. After the Secretary leaves, the Junior Deacon, another official who had served as inside door keeper, joins the candidate and the Stewards and takes charge of preparing the candidate for initiation. He is taken into the preparation room, is divested of his coat, vest, pants, boots, stockings, drawers, neck-tie, collar — in fact, everything except his shirt. He is then handed a pair of drawers (always furnished by the Lodge) which he puts on. All the studs, sleeve — buttons and other furnishings are taken off his shirt. Everything of a metallic kind is taken away. The left leg of the drawers is rolled above the knee, so as to make the left foot, leg, and knee bare; the left sleeve of his shirt is raised above the elbow, so as to make the left arm bare; and the left breast of the shirt is tucked back, so as to make his left breast bare. A slipper is put on his right foot, with the heel slipshod; a hoodwink (blindfold) is fastened over his eyes; a blue rope, called a cable-tow, is put around his neck, and he is then duly and truly prepared to be made a Mason. The candidate has no idea why this is done, except he is told that it is necessary — the explanation must come later. The candidate is kept in a state of profound darkness and all is calculated to confuse and bewilder him. Once the hood-wink is placed over his eyes, he can see nothing and must rely totally on his other senses. Next, the candidate is conducted by the Junior Deacon to the door, where he is caused to give, or the Junior Deacon gives, three distinct knocks, which are answered by three from within. What goes on behind the closed door is still an enigma to the candidate — all this for the purpose of filling him with awe and cultivating an air of mystery. The door is then partially opened. 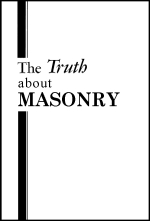 Once finished with "work" in the first degree, all first degree Masons are discharged because they are not allowed to see what goes on in a higher degree. Then follows the — to the second, or Fellow Craft, degree. This is done in similar fashion to the act of lowering to the first degree. Once our candidate has become a member of the Entered Apprentice degree, he is eligible to become a candidate for the next or Fellow Craft. Before he can do so, however, he must master the art of giving the secret signs, passwords, and the examination. The part referred to as the examination is often called by other names such as "lecture." The word examination will be used here to keep from confusing it with the lecture delivered by the "Worshipful Master." The examination is a ritualistic catechism of the signs, tokens, and working tools of the degree. There is an examination to be memorized for each of the first three degrees, but none for the degrees beyond that. The degrees above the third or Master degree are very recent in origin and are in actuality adoptive — the first three originally comprising the total of Freemasonry. When the candidate has learned the examination of the first degree, he is ready to apply for the Fellow Craft degree. Here he is initiated, introduced to new "working tools," taught the new handshake, due — guard, distress sign, secret words, and given a lecture on their symbolic meaning. Then he is required to memorize another examination. The average member of a popular denomination would see absolutely nothing wrong with Masonic proceedings. They appear wholesome and up-right to him; and unless a member of God's true Church is alert, he may see nothing wrong either — especially if that member is a new convert. But this is exactly what the pagans did — worshipping atop high hills or in the depths of valleys! Read what God says about it in Jer. 2:20-23 and II Kings 17:9-11. Their leaders took every precaution to make it look good and upright. Each part was unveiled and explained with reverence and solemnity. The Bible, among Christian nations, was quoted often to show divine sanction. The Lodge seemed beyond question. It was truly a shocking awakening to some to find Lodge teachings and practices of pagan — not Christian religion. Some are not yet convinced that ALL Masonry is pagan even though it has been proven that its oaths are anti-scriptural and that its secrecy is likewise contradictory to the Bible and pagan in origin. They reason, "If you look hard enough, you can find a little something wrong with any organization. Certainly the other practices and symbols with their allegoric meanings are sanctioned by God's word!" He did not find this in the Bible! The sun and the moon are important Masonic symbols, just as they were in the old Babylonian mysteries! This doctrine concerning them comes from ANCIENT SUN WORSHIP. The offspring, a blazing star, is of Egyptian origin — that same offspring which has been worshipped by pagans for generations Cinder many different names, one of them being Horus, another Anubis. When one pictures Masons in this situation, he cannot help but remember Ezekiel 8:15 where God points out to Ezekiel the WORST OF THE ABOMINATIONS — "And he brought me into the inner court of the Lord's house, and behold, at the door of the temple of the Lord, between the porch and the altar were about five and twenty men, with their backs toward the temple of the Lord, and their faces toward the east; and they worshipped the sun toward the east. "This is exactly what the Masons are doing. Is it possible that the future fulfillment of this prophecy will take place when some Jewish Masons will be in the temple of God and will actual turn their backs on Him to worship other gods? The Masonic ladder, introduced to the candidate in the lecture of the first degree as having three rounds — faith, hope and charity — is only for the novice. Masons use other "Jacob's Ladders" with greater numbers of rounds and with different names in the lectures of the higher degrees. One has seven rounds and is also supposed to reach to heaven. The first round (or gate) was made of lead and represented Saturn because of the "heavy nature" whereof his "dull slow progress" was symbolized. The second, of tin, was that of Venus, symbolizing her "soft splendor" and easy flexibility." The third, of brass, was that of Jupiter, emblematic of his "solidarity" and "dry nature." The fourth, of iron, was that of Mercury, expressing his "indefatigable activity" and "sagacity." The fifth, of copper, was that of Mars, expressing his "inequalities" and "variable nature." The sixth, of silver, was that of the moon. The seventh, of gold, that of the sun. (Morals and Dogma, p. 414.) Needless to say this doctrine comes from the ancient pagans, and if we take its symbols literally, it means that Masons attempt to reach heaven by means of honoring these pagan gods and being aided by them along the way. This is even made clearer in the ceremony of the first degree when the Senior Warden informs the candidate "as the sun rises in the East to open and govern the day, so rises the Worshipful Master in the East (here the "Worshipful Master" rises to his feet in demonstration) to open and govern his Lodge?" "Once enrolled among the children of Light, every Mason on earth becomes his brother, and owes him the duties, the kindnesses, and the sympathies of a brother. There is not a Mason in the world who is not bound to go to his brother's relief when he is in danger, if there be a greater probability of saving his life than of losing his own. What so many thousands owe to him, he owes to each of them. He has solemnly bound himself to be ever ready to discharge this sacred debt. If he fails to do it, he is dishonest and forsworn." when we understand the Masonic view, we should be able to see why Masonry does not want to be classed among the religions, or denominations, but pictures itself as encompassing them within the "brotherhood." If the "brotherhood" should grow to encompass the whole earth, then would be the fulfillment of the Masonic ideal — the philosophy known as "The Brotherhood of Man and the Fatherhood of God." To demonstrate the futility of that effort and the worthlessness of its empty findings we quote a noted Masonic writer. His name is Oliver. His book, Theocratic Philosophy... "Masons may be fifty years (Worshipful) Masters of the chair and yet not learn the secret of the Brotherhood. This secret is, in its own nature, invulnerable; for the Mason, to whom it has become known, can only have guessed it and certainly not have received it from anyone; he has discovered it because he has been in the Lodge marked, learned and inwardly digested. When he arrives at the discovery, he unquestionably keeps it to himself, not communicating it even to his most intimate Brother, because, should this person not have capability to discover it of himself, he would likewise be wanting in the capability to use it, if he received it verbally. For this reason IT WILL FOREVER REMAIN A SECRET." (Lennhoff, pg. 19-20.) The keeping of such an august secret from even your closest brother seems foolish indeed. This is, of course, not the true answer to life's questions as revealed by the Bible. Adam was created by God and given the same choice which you and I face today: Obedience, and life or disobedience, and death. Adam, just as you and I, had no immortal soul; and, as you and I, he grew old and died. God would have raised him to immortality; however, he chose the way of disobedience and God left him to its reward — death. Thereby Adam set the example of disobedience which mankind has followed ever since (see Rom. 5:14-15). Brethren you and I should turn from that example and follow Christ's example of obedience to God that our reward might be life through the resurrection. I will not embarrass ex-Masons of our Church brethren by exposing the absurdity of the "secret rites" connected with this legend. Let it suffice to say that they are merely a ritualistic acting-out of the legend in which certain passwords, distress signs, grips etc. are introduced and demonstrated. The Masons then learn these secret tokens and use them to identify themselves and convey certain information to one another in everyday life. Alexander Hislop in The Two Babylons gives some of the reasons for Nimrod's fame. On page 52, he writes that all tradition, from the earliest time, bears testimony to the apostasy of Nimrod and to his success in leading men away from the patriarchal faith. He delivered their minds from the awe of God and the fear of the judgments of heaven. Hislop showed also (p.50) that Nimrod was the object of high popularity, and through setting himself up as king, invaded the patriarchal system and curtailed the liberties of mankind. Yet, Nimrod was considered a hero and liberator to all his followers. No doubt it was because he "freed" them from following the way of God by giving them a counterfeit way — one which allowed them to follow their own lustful imaginations. "Now," says Hislop on page 57, "when this mighty hero, in the midst of his career of glory, was suddenly cut off by a violent death, great seems to have been the shock that the catastrophe occasioned. When the news spread abroad the devotees of pleasure felt as if the best benefactor of mankind were gone... Then began the weeping for Tammuz (identified as Nimrod) in the guilt of which the daughters of Israel allowed themselves to be implicated (Ezek. 8:14). After the dividing of languages at the tower of Babel (Gen. 11:1-9), and the scattering of the nations, the names of these deified persons were changed and the legends about them grew in detail in each nation. New and different feats, characteristic of the nation in which they developed, were attributed to them and more symbols were adopted to picture these feats. Furthermore, the adoption of new gods did not end with these three. Other gods and goddesses continued to be created in human imaginations. Today, any study of pagan beliefs and customs is made extremely difficult by this great confusion. An accurate description of the worship and doctrine about any one of these gods would have to be limited not only to the nation, but to the locality and sect within that nation and the year of its occurrence, because everything was constantly changing. Yet, through it all, the central theme which deifies the person of Nimrod, Semiramis and her illegitimate son was retained in practically all ages and nations. It is the chief tenet of all the "Ancient Mysteries." Osiris, with the aid of Isis, taught his subjects agriculture and all the arts and crafts, conquering the rest of the world to civilize it. His brother Seth (whom Greeks called Typhon) treacherously murdered him, and cast the coffin containing his body into the River Nile. Drifting away to Byblos, it was discovered by Isis and taken back to Egypt. Seth again found the corpse, and cutting it in pieces, he cast them into the Nile — but Isis found them (more thorough accounts of the legend show that all but one part was found, the genital organ, for which she substituted the "Phallus"). Then came Horus to avenge his father Osiris, and the gods justifying Osiris, restored his body to life and immortality. This death and resurrection was symbolized daily by the setting and rising of the sun, and also yearly by the seasons during which the sun recedes until the winter solstice, then begins to be slowly "resurrected back to life." Seth (or Typhon) was the symbol of winter which destroys the fecundating and fertilizing powers of the sun, depriving him of life. When Seth was killed by Horus, the sun began to climb higher in the sky, as if being resurrected by the gods. It was a time for rejoicing. This custom of rejoicing at the time of the winter solstice has continued to our present day when people who call themselves Christians celebrate this pagan custom thinking they celebrate Christ's birth. When Isis found Osiris's body one part was lost — the genital organ. When the Fellow Craft finds Hiram's body one part also is lost — the Master's Word. Isis substituted the Phallus; Masons substitute Mah-hah-bone. From Masonic writings Masonry Defined, pg. 643, 608, Mah-hah means literally, "What is this the" — and bone, coming from the Hebrew word boneh, means "builder." Mah-hah-bone then means, "What is this the builder?" Thus, in one fell swoop, Masonry abolishes all pretext of encouraging its members to believe in the Holy Scriptures upon which it claims to base its allegories and upon which its oaths are administered. By this final secret they confirm what was always implied in the Lodge — that the way of life revealed in the Bible and God's plan of salvation outlined in it are lies — that man cannot know God nor understand his relationship to Him. The earliest work on the subject was published in London in 1723 by the Rev." James Anderson, and it states: "Grand Master Moses often marshalled the Israelites into a regular and general Lodge while in the wilderness... King Solomon was Grand Master of the Lodge at Jerusalem... Nebuchadnezzar became the Grand Master Mason." Many more similar absurdities are to be found in its pages. These statements are quoted and declared absurd, ridiculous, and extravagant by no less authority than the Encyclopaedia Britannica (see "Freemasonry," p.732). Undaunted, Masons continue to make such claims, and many members of the Lodge believe them implicitly. When we examine the form and ceremony of Freemasonry, we find a marked resemblance between it and the old guild systems which flourished in Europe at the time Freemasonry came into existence. These guilds played an important part in the social, religious, and political life. They, in turn, were patterned after the earlier Roman guilds or fraternities. The Roman guilds seem to have been chiefly religious and political societies, while the associations of workmen known as the Roman colleges of artificers were hereditary castes enjoying certain privileges and bound to certain duties — Encyclopedia Americana, caption, "Guild." Even these Roman guilds and colleges are not the oldest forms of such societies, but seem to be a connecting link between ancient pagan societies and the more modern ones. (1) "Freemasonry has peculiar Unsectarian, naturalistic character, by which theoretically and practically it undermines the Christian faith (or Catholic faith)... creating religious indifferentism and contempt for orthodoxy and ecclesiastical authority. Today in modern "Christian" lodges it is becoming more popular to accept the two Johns — John the Baptist and the Apostle John — as the ones who started the first lodge. This absurdity comes from a confusion of ancient and modern interpretations of the symbols pictured in Figure 11. Pike further shows (p.506) that the two columns called Jachin and Boaz and the parallel lines actually represent older pagan symbols: the solstices, Cancer and Capricorn, the two gates of heaven, the two pillars of Hercules. He further showed that the point in the circle represented the sun god (Osiris). These parallel lines represent limits — good and bad, positive and negative, active and passive, light and darkness — beyond which the sun god will not go. He claimed the West eagerly connected their faith with those of the East, and the Orient hastened to learn the traditions of Rome (this should not have been too difficult because they both came from the same old Babylonish source). The Jews and Egyptians — before, the most exclusive of all peoples — yielded to that eclecticism which prevailed among their masters, the Greeks and Romans. Thus men who embraced Christianity began to mingle the old mysteries with the new — a mixture of Christianity and Philosophy, or Apostolic teaching and traditions of Mythology. This thinly veiled admission by Masonry's most famous apostle, Albert Pike, explains why Masons call their temple Solomon's Temple when it was in actuality patterned after the greatest of pagan temples — the earth covered by the cloudy canopy of the heavens. The divinity which they worship within its walls is the sun, of which they blandly write. A careful study of the Holy Scriptures, however, reveals that this Hiram Abiff has nothing in common with the Hiram mentioned in I Kings. Neither is the temple around which the legendary story unfolds, the temple of Solomon. The temple of God, built by Solomon, was finished, but the one in the legend remained unfinished. The names were just added in "friendly" pagan — Christian tradition. "The sprig of acacia (the pagan symbol of life which, in one account, led her to discover her husband's grave) in her right hand denotes the timely discovery of the body." (The body which the ancient pagans tried to preserve, and which action gave rise to another pagan philosophy — that so long as a body remained in a state of preservation, the person's spirit continued to exist). FREEMASONRY is living proof that no teaching of man, regardless of how innocent or righteous appearing, can be taken for granted — that no teaching can be assumed good, just because it looks good — that no teaching can be assumed righteous, no matter how solemnly it declares itself so?or judged honorable because its own cherished records suggest honor. Now let us compare this with their actual practice. The Real Test God has set before each one of us a choice — a proving ground — to see whether we will love and obey Him and be allowed to live in the Kingdom which will be set up?or whether we will refuse and go our own way, into the lake of fire (Deut. 30:19-20). God declares there is only one WAY to live happy, useful lives. And that is the way HE has appointed for us. Any other — such as Masonry — no matter how good it may look, is at best a counterfeit and serves only to dupe people into thinking that they have what they have not. I. God is the Eternal, Omnipotent, Immutable Wisdom and Supreme Intelligence and Exhaustless Love. Thou shalt adore, revere, and love Him! Thou shalt honor Him by practising the virtues! II. Thy religion shall be to do good because it is a pleasure to thee, and not merly because it is a duty. That thou mayest become the friend of the wise man, thou shalt obey his precepts! Thy soul is immortal! Thou shalt do nothing to degrade it! So if the Mason is truly adept he would see that he has borrowed from the ancient sun worshipers symbols and creeds which would read this way for the first commandment of Figure 12. "God [the god whose symbol is a circle and a cross and triangular dots — the sun god) is the Eternal, Omnipotent, Immutable WISDOM and Supreme INTELLIGENCE and Exhaustless LOVE. (Wisdom, Intelligence and Love are capitalized to remind Masons of their I deeper meanings and that each in turn has been worshiped by their pagan ancestors). What greater blasphemy could there be than this? How this must stink in the nostrils of the Living God! When they attribute the name and office of God to any other they break the first, second and third of — God's Commandments. The ex-Mason should realize, however, that withdrawing membership from the Lodge does not of itself release him from the many oaths he has taken. If he really believed, at the time, that he took the oaths to Almighty God, and unless these oaths prevent him from serving God and obeying His Laws, he should consider himself bound by them (Numbers 30:2).